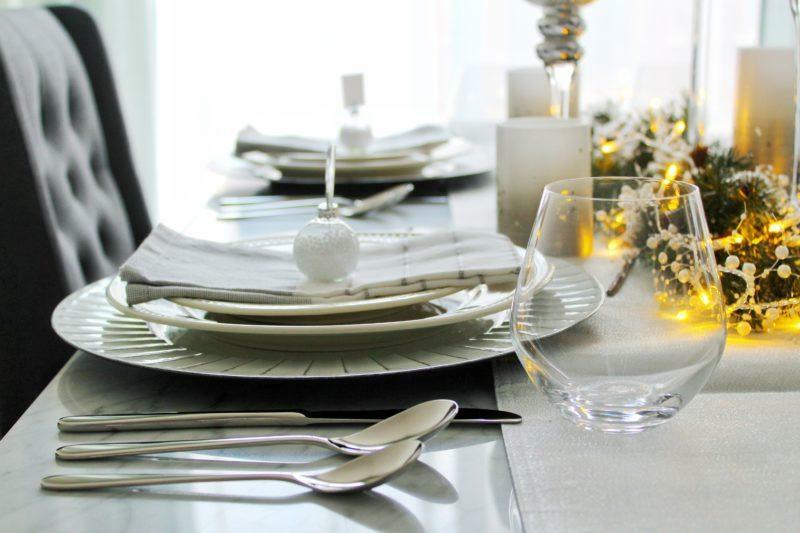 So the holiday season is upon us, and it’s got you running around trying to juggle the million things you need to do to get ready for the festivities… parties, dinners, gift shopping, and so much more. Sounds familiar, right? I won’t lie, I always panic when I have a dinner holiday party to plan, and I always end up doing things last minute because of my busy schedule. 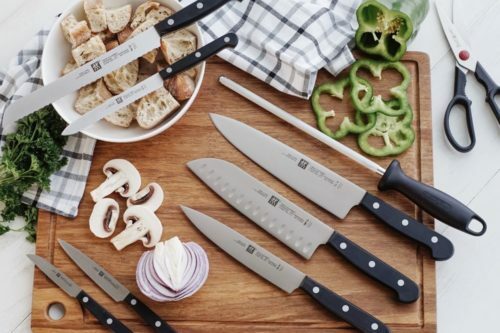 But don’t worry, this year, with the help of Kitchen Stuff Plus, I realized how easy it was to put together a stunning tablescape and what a huge impact it will make on your guests. 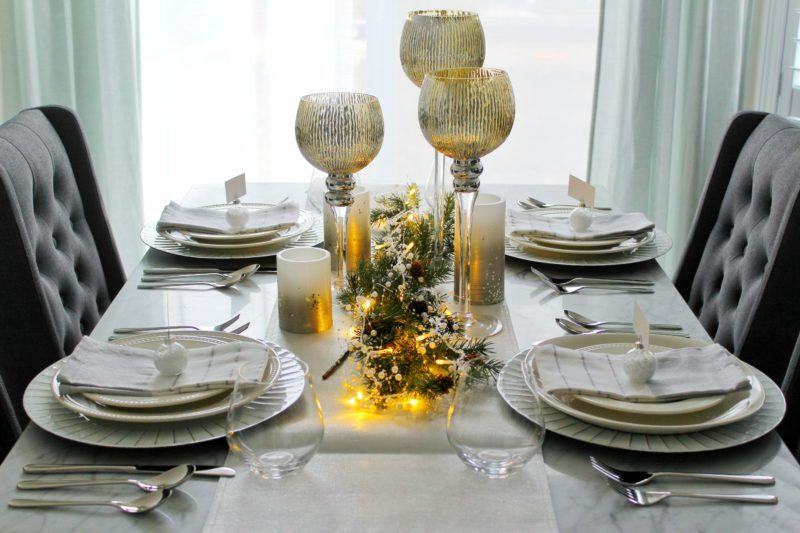 The most important element of your tablescape is the centrepiece of course! And to make it extra beautiful and captivating – be sure to add light and height. I like to have my centrepiece span most of the length of my table. 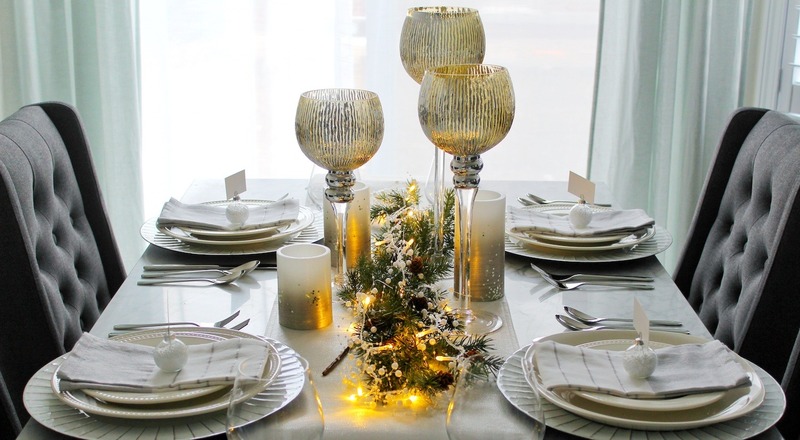 I started by choosing the Harman Christmas Luxe Shimmer Table Runner, which was the perfect base. 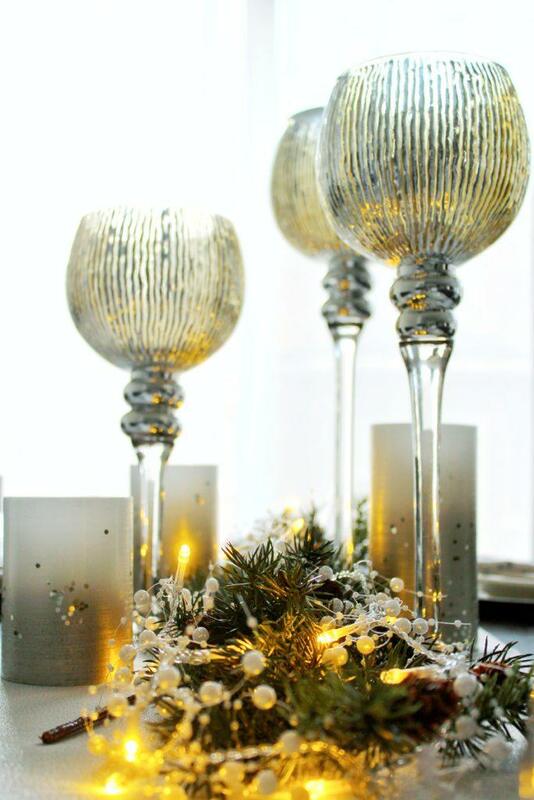 I then fell in love with the Christmas Glow Glass Stem Candleholder in gold (it comes in red too by the way!) and it was great for adding the height I wanted. And because I’m a candle fanatic, you can never have too many of those on a table centrepiece, so I layered on the Christmas Glow LED Pillar Candles. These candles are so great! They come with a remote control and a few settings, and they’re absolutely amazing for mamas who get anxious having an open flame around children. My final element for the centrepiece, which added the perfect touch, was the Pearl Indoor String Lights, which I draped over some greenery I had. This made the whole spread look so magical! Next up is to decide colour scheme with the dinnerware. 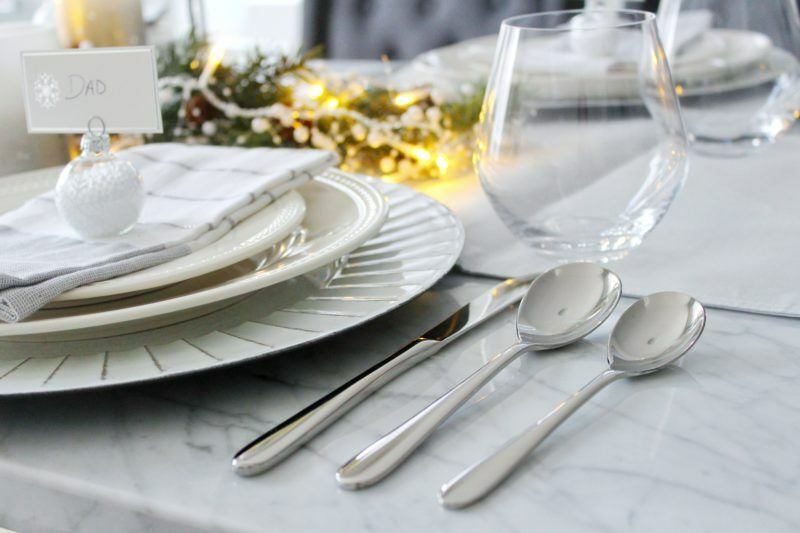 I absolutely love classic dinnerware, and I’m obsessed with silver. So I went with a wintery white and silver setup, with a few gold accents. The options are endless here though – choose colours that will complement your dining table and show off your personal style. I chose the Thomson Pottery Pearlina Stoneware Dinnerware set, which is timeless and elegant, and comes with 16 pieces. Don’t forget to add a plate charger! I never used to do this, but now that I’ve tried it, I’m never going to skip out on them. They’re so beautiful and make the set up look that much fancier. Next up is choosing your glassware, and I went with the beautiful Trudeau Savour stemless wine glasses. 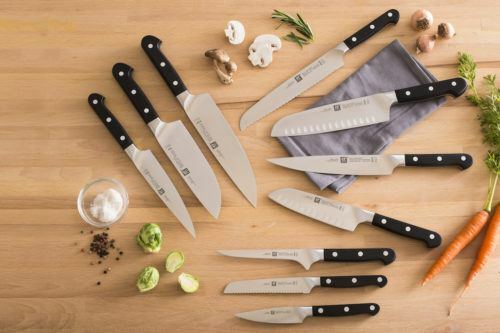 Finally, I placed my favourite new shiny cutlery set – the Splendide ‘Contempra’ 20 piece set which has such a sleek and modern style. The last thing to do, which is sure to put a smile on your guests’ faces, is to add a personal touch. 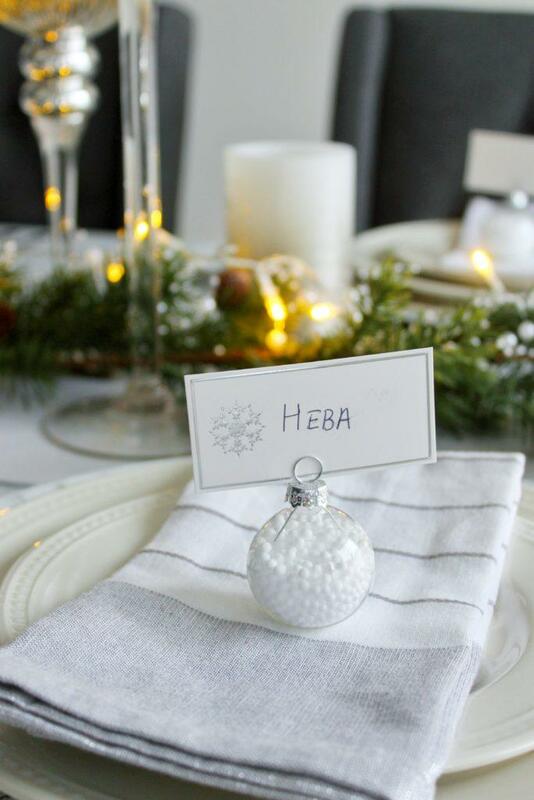 I love the Festive Ornament Name Card Holder – it’s so cute! When you write the names on the name cards, you also get to decide the seating arrangement, which can be a bonus! I also added festive napkins on every table setting. You can do so many other things to add that personal touch. Try adding a small gift such as an ornament, or even a little chocolate would be so adorable! Get creative with this one. 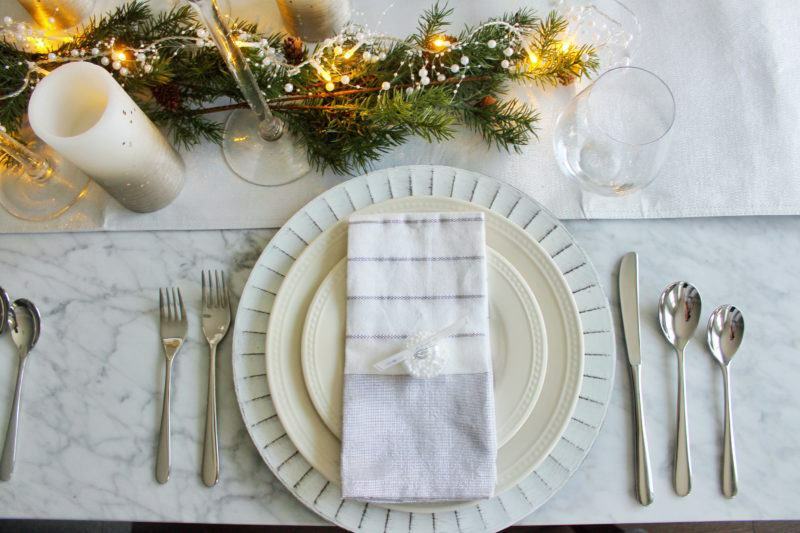 So there you have it everyone – inspiration for you to put together a beautiful holiday tablescape for your next dinner. 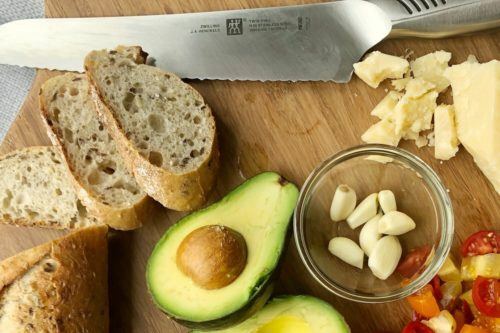 It’s so easy and fun, and everything you need you’ll find at Kitchen Stuff Plus. Have fun! 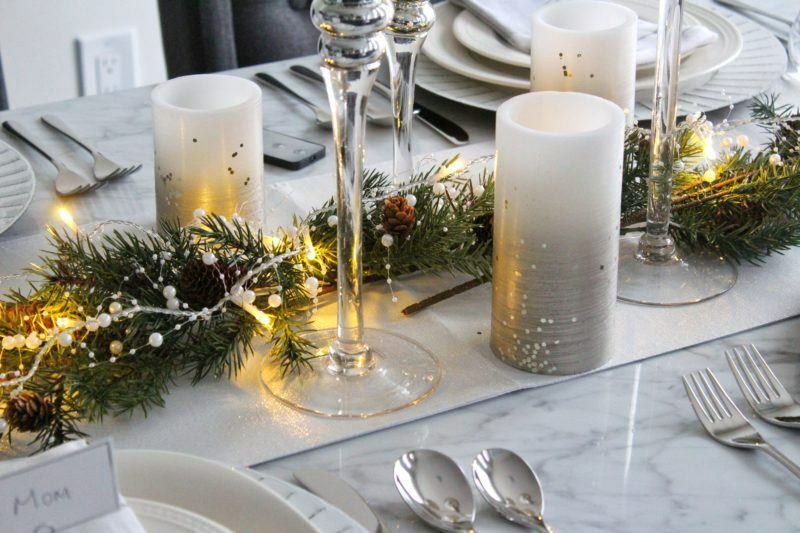 Shop Amina’s picks for creating a gorgeous tablescape here, including picks from her favourite cozy holiday decor essentials.